Previous image, 69 total items. Next image, 69 total items. 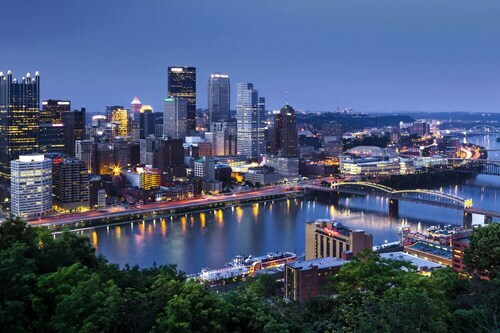 Have you considered securing a Pittsburgh vacation package? It's a piece of cake with Expedia, and you'll be able to buy some nice dinners or souvenirs for your buddies back home with the money you save. Savings of up to 40,450 YEN* are waiting for smart travelers who book a package deal on Expedia. Click through our global database of more than 400 airline partners and 321,000 worldwide properties. Too many on there to choose from? Don't worry — we'll help you decide! If you have to change your vacation plans, we will honor your cancellation request on nearly all reservations with no hidden fees. Itinerary need a little padding? Pittsburgh vacation all arranged but don't know what to expect when you arrive? Let us make it easy for you. There are plenty of reasons to experience this spirited city, and the Duquesne Incline and the Monongahela Incline are some of them. Conveniently, they're not too far from the heart of town. Classy decor, magical lights and smartly dressed staff are a few of the things you'll discover at Rivers Casino. Stroll around the blackjack tables or simply sit back with a cocktail and enjoy the atmosphere. There's an excellent range of things to keep you busy in this destination. Look over the upcoming events at Stage AE for a range of sensational shows. Still got some time on your hands? It's often said that today's science is tomorrow's technology. Visit Carnegie Science Center and marvel at some of our most fascinating discoveries. The world is alive with adventure, and there are plenty of extraordinary experiences to be had when we grab our bags and go on vacation. Get your vacation in Pittsburgh off to a cracking start with a Dining at Hard Rock Cafe Pittsburgh with Priority Seating or an Operation City Quest of Pittsburgh, PA.
For a full range of options, go to our Pittsburgh things to do page. Wrap up your day of fun adventures with a cozy bed and a soft pillow. Look at the 53 accommodations in Pittsburgh available via Expedia and select one for your luxury getaway or cheap vacation. Begin your search for an upmarket Pittsburgh base by investigating the latest offers at the Fairmont Pittsburgh (510 Market Street) and the Renaissance Pittsburgh Hotel (107 6th St). If you don't fancy handing over such big bucks, why not spend your nights somewhere more affordable? Consider The Westin Convention Center, Pittsburgh (1000 Penn Ave) or the Homewood Suites by Hilton Pittsburgh Downtown (1410 Smallman Street). Pittsburgh International Airport (PIT) is the starting point for most travelers taking a trip to Pittsburgh. It's located 14 miles (23 km) from the heart of town. A walk across this local favorite bridge is a must-do, especially when it’s closed to vehicles during sporting events. Unwind with a walk along a wooded trail, or play a game of tennis or disc golf, in one of Pittsburgh’s largest and most popular parks. Learn all about one of Pittsburgh’s most famous and eccentric native sons in this museum dedicated to the king of pop art. Spend a fun-filled day making your way between over 30 rides and attractions in one of the oldest continually running amusement parks in the United States. From rare jaguars to geological marvels and ancient fossils, you’ll find it all at this Pittsburgh institution, one of the country’s largest natural history museums. Young imaginations will run wild in this interactive and innovative place to play and learn. Find everything from palms and ferns, to orchids and desert flowers in one of America’s largest glass houses. Marvel at giant condors, feed lorikeets and meet penguins at one of the largest aviaries in the United States. If you like your art with a modern twist, you’re in for a treat at this exceptional museum, which also features impressive furniture and architecture galleries. Explore 250 years of Pittsburgh’s past at the largest history museum in Pennsylvania. Get up-close and personal with nearly 500 species of animals at one of the country’s premier zoo and aquarium combinations. Sunbathe in the shallows beneath the giant fountain, walk the riverside trails and explore the rich history of Pittsburgh in one of the city’s favorite parks. Take an audio tour and admire the majestic Commons Room and Nationality Rooms in one of the world’s tallest Gothic buildings. Situated in Pittsburgh, this hotel is 3 mi (4.8 km) from Duquesne Incline and within 6 mi (10 km) of Rivers Casino and PNC Park. Andy Warhol Museum and Station Square are also within 6 mi (10 km). This downtown hotel is at the gateway to the cultural district, facing Point State Park and Pittsburgh's famed Three Rivers. Hyatt Place Pittsburgh-North Shore is located across the river from downtown, with a free hotel shuttle and a nearby metro station putting downtown within easy reach. Sports fans can catch a Pirates game at PNC Park or a Steelers game 4 blocks away at Heinz Field. Art lovers might want to check out the Andy Warhol Museum. 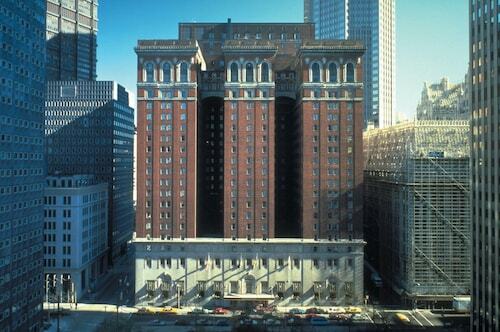 The historic Omni William Penn Hotel is opposite Steel Plaza T Station in downtown Pittsburgh. Guests can walk 4 blocks to Heinz Hall for the Performing Arts, or drive 10 minutes to the Andy Warhol Museum, the largest museum in the United States devoted to the works of a single artist. Situated in the suburbs, this hotel is 5.1 mi (8.1 km) from Cranberry Township Community Waterpark and within 12 mi (20 km) of Ross Park Mall and UPMC Passavant Hospital. La Roche College is 9.7 mi (15.6 km) away. Standing along the banks of the Monongahela River, this hotel is in Station Square, the city's playground, brimming with restaurants, shops, and nightlife; the Gateway Clipper Dock is adjacent, providing easy access to PNC Park and Heinz Field. An enclosed, climate-controlled, moving walkway connects this well-appointed hotel directly to Pittsburgh International Airport. IKEA and other top shopping destinations are 5 miles away. 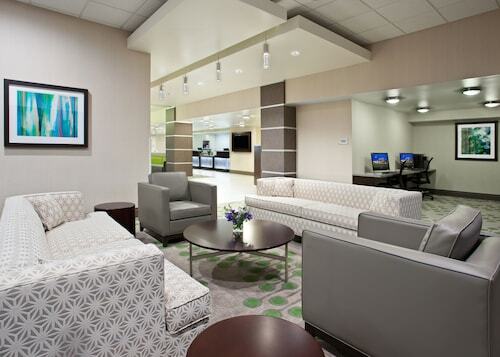 Located in Bloomfield, this hotel is within 1 mi (2 km) of UPMC Shadyside and University of Pittsburgh. Carnegie Mellon University and Cathedral of Learning are also within 2 mi (3 km).